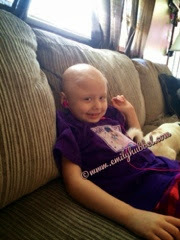 This was the first week that Emily didn't need any transfusions (blood or platelets)! Woo hoo. Emily had clinic yesterday. Dad too her to clinic and she did well. Blood pressure is still looking good. First Pass Image Scan (nuclear heart scan) that was done on Tuesday came back fine so we know that her heart is doing fine. Heart rate is still very high though with yesterday being 147! Platelets did drop from 42 to 33 but we are willing to wait as was Dr Gowda to see how she would do! Hopefully they will start to come back up on their own again. Dr Gowda did say he was going to let Dr Bunchman know about Emily's heart rates because he still continue to wonder/worry if it has something to do with her kidneys. So we are supposed to be meeting with Dr Bunchman again in a couple of weeks and we will just keep a watch on her heart rate! She also had Day 28 on DFMO to report information back to Michigan yesterday as well! Emily will return to clinic on Tuesday for count checks and see where things are. Good week for Emily though. She is doing really well. Earlier in the week she had some hip pain but we all think as well as Dr Gowda it's just her bone marrow working hard! 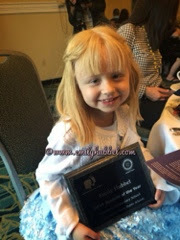 Thursday night Emily was honored as "Student of the Year" for her school for Kindergarden through 2nd Grade! We had a banquet in Thursday night where she was honored along with another student for 3rd - 5th grade as well as all the others from the other schools! It was really a big deal for Emily and she was so happy and did really well! Dad and I were super proud of her and for her accomplishment even with all she is going through! Michigan did contact us and said they are working on scans for the week of May 19th, so right now we are just waiting to get the confirmation of it but. Our plan is to continue to keep her on DFMO as long as she remains stable! Once we keep her counts up we also hope to get her back to school. The hope is to her counts up and stay up so that we can get her on the vaccine trial under Dr Lucas! Please continue to keep Emily in your thoughts. 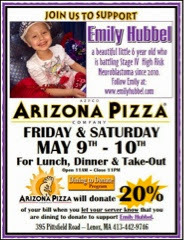 If you live in the Massachussetts area there is a fundraiser for Emily on May 9th and 10th at a local restaurant if any are able to make it. We appreciate all the love and help!! Thank you . Remember to hug and kiss your kids and tell them how much you love them!